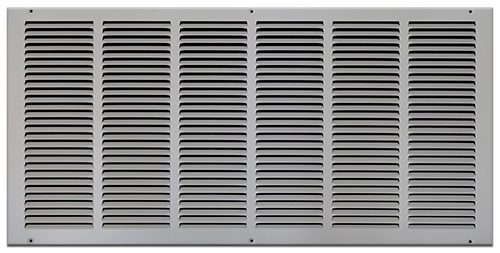 36 X 18 Stamped Steel Return Air Grille - White Discounts Apply ! White return air vents are made with an enamel finish to help protect the integrity of the coloring. Our metal grilles are constructed from steel and have a 5/16” depth. These 36 x 18 return air vents are simply installed onto your wall or ceiling by screw mounting them into place. Screws come with each vent. The metal grilles do not have a damper unit, allowing them to lay virtually flat against your duct opening. Return air vents in the 36 x 18 size can be hard to find and is the largest size we carry. Our metal grilles are made in a traditional design for a simple, clean look. *** Hint: The return air vents are listed online by the measurements of the hole opening in your wall. Do not order a vent based on the measurements of your existing grill. You can view a submittal drawing from the manufacturer by clicking on the link to view 2nd image. *** Please Note: The cost incorporates the special box that is needed during shipping to help protect the grille, due to the larger size. Find decorative plastic or metal grilles on our site for those looking for something with flair. These 36 x 18 white return air vents are an economical option, order with us today and cover up unsightly duct work.